The APN, in partnership with the Namibia University of Science and Technology (NUST), held a two-day regional Media Training Workshop on the theme: “Improving Media Coverage of Conflict and Peacebuilding in Southern Africa.” The workshop, facilitated by APN Alumnus and NUST lecturer Dr. Admire Mare (IRG 2013), is part of a series of media practitioner training workshops organized by the APN, following earlier ones held in West and East Africa. 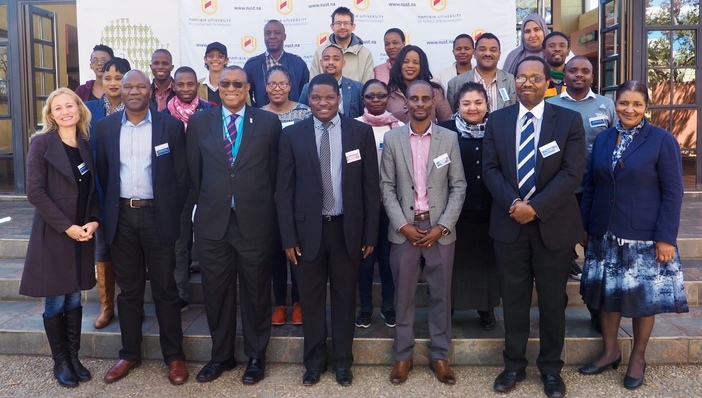 It brought together journalists, media practitioners, and academics from Namibia, Mozambique, South Africa, Swaziland, Zambia, and Zimbabwe. Two additional APN Alumni, Dr. Rose Jaji (IRG 2017) and Dr. Stanley Tsarwe, participated and gave presentations at the workshop. NUST Vice-Chancellor Prof. Tjama Tjivikua opened the workshop by welcoming participants to Namibia and conveying his expectation that the workshop would “enhance the capacity of Southern African Journalists to report on conflict." Prof. Tjivikua emphasized the role of the media in “shaping our perceptions of one another and the potential for that power to be misused,” underscoring the responsibility of journalists to be professional and cognizant of their influence. The Dean of Human Sciences at NUST, Prof. Alinah Segobye, stressed the need for scholars in the human sciences to study the relationship between media and peacebuilding. She also acknowledged the risks that journalists take when reporting on conflict and expressed hope that the workshop deliberations and outcomes would awaken a keenness to the critical work that journalists do. In his opening remarks, APN Program Director Dr. Cyril Obi highlighted the Social Science Research Council’s goal of promoting social science knowledge globally to impact public policy. He spoke to the role of African media in conveying the power of peace, more specifically, “transformative peace,” which promotes justice and prosperity. Dr. Obi discussed the APN’s focus on connecting scholars and practitioners to generate useful synergies for social inquiry and policy-engaged research that serves society. He also emphasized the importance of partnerships—with African Universities, organizations, and practitioners—to the work of the APN. UNESCO Representative to Namibia Dr. Jean Pierre Iiboudo then delivered remarks on “Media and a Culture of Peace." He gave an overview of UNESCO’s program of action to promote a culture of peace and non-violence in fragile and conflict-affected areas. He argued that the media could play a crucial role by promoting values that are essential to peace, such as gender equality, democratic participation, tolerance, and free access to information. A “culture of peace,” he argued, would be difficult to attain without a suitable media space and access to reliable, fact-based information. Prof. Dumisani Moyo, the vice-dean of the Faculty of Humanities at the University of Johannesburg, delivered the keynote address on "Media, Conflict, and Peacebuilding in Southern Africa." Prof. Moyo described the media as a powerful force that can be used and abused according to the interests of those who own and control them, pointing to the media’s tendency to simplify complex narratives and promote “us versus them” dichotomies. He identified three steps that can help improve the media landscape in southern Africa: reduced state ownership and control of media, sound regulatory systems to rein in abuses, and improved training of media practitioners. The following presentation on “Conflict Management and Indigenous Knowledge Systems in Africa” was delivered by the head of the Department of Communication at NUST, Dr. Rewai Makamani. He explained that conflict reporters could contribute to peacebuilding processes by exploring the backgrounds and contexts of conflict formation, giving voice to views of all rival parties, and identifying victims and perpetrators of excesses/crimes on all sides. Dr. Makamani urged African journalists to incorporate indigenous philosophies, such as Ubuntu, into their practice. APN Alumnus Dr. Rose Jaji (IRG 2017) gave a presentation on "Gender, Conflict, and Peacebuilding in Zimbabwe" during which she urged journalists to reject sensational reporting and be more critical in their coverage to avoid entrenching cultural violence. Specifically, she called on journalists to criticize toxic, vulgar, and potentially inflammatory rhetoric, and to avoid participating in personal and gender-based attacks. Dr. Jaji also called for more reporting that normalizes and supports women’s participation in peacebuilding. Ms. Wanja Njuguna, a lecturer at NUST, spoke on the “Role of Citizen and Professional Journalism in Mediating Electoral and Ethnic Conflict in Kenya.” She compared local media coverage of Kenyan elections in 2007, 2013, and 2017, to trace the evolution of election coverage against the backdrop of increasing access to “online media” and the proliferation of media outlets. In 2007, the Kenyan media was seen as a catalyst for the violence that emerged, especially the radio stations broadcasting in regional languages in the Rift Valley region. In 2017, many in the Kenyan media wanted to avoid being accused of irresponsible coverage that might exacerbate tension. Ms. Njuguna explored some criticisms of their approach to “peace journalism”—which critics said weakened their credibility by shifting their focus away from controversial but important issues. The presentation was useful in illustrating the practical difficulties journalists face when balancing these priorities. To close the proceedings on day one, Dr. Admire Mare moderated the first of two sessions for journalists to speak candidly about their experiences covering conflict in southern African countries. The participants were: Veneranda Langa and Fungisai Kwaramba of Zimbabwe, Mike Sichula and Mwape Kumwenda of Zambia, and Augetto Craig of Namibia. Day two opened with the second panel for workshop participants to talk about their experiences in Southern African countries. Qaanitah Hunter and Karabo Ngoepe of South Africa, Armando Nantumbo of Mozambique, and Jabulisa Dlamini of Swaziland shared their experiences of covering conflict and peacebuilding initiatives in their respective countries. Afterward, APN Alumnus Dr. Stanley Tsarwe (IRG 2013) spoke on “Media and Elections-Related Conflict.” He challenged journalists to reflect on the impact their reporting can have on a country’s democratic process. Among issues covered were the causes and effects of bias in election reporting and the role of media in propagating hate speech. Dr. Tsarwe urged the participants to avoid journalism that thrives on the dichotomy between winners and losers. "Peace journalism," he explained, gives voice to victims, is socially responsible, people-oriented, and truth-oriented. To illustrate how media can threaten the consolidation of peace in a country, he gave several examples of biased and inflammatory election coverage by sections of the Zimbabwean press over the past ten years. To address the timely and critical issue of fabricated news, Dr. Nkosinothando Mpofu of NUST and Hatikanganwi Mapudzi of University of Fort Hare led an interactive session on "Media, Conflict, and Fake News." The session gave participants an opportunity to debate, and reflect on what fake news is and how it differs from older forms of false news, how it can undermine “peace journalism,” and best practices for how to identify and combat the spread of fake news. Prof. Ylva Rodny-Gumede of the University of Johannesburg spoke on “The Theory and Practice of Peace and War Journalism." She pointed out the tendency of news media to seek out conflict and “sell” bad news as opposed to “peace Journalism” which avoids unnecessarily pitting two sides against one another. Prof. Rodny-Gumede addressed a common misconception about peace journalism, which does not stipulate that journalists should become peacemakers, only that they should think critically about how their reporting can exacerbate or mitigate violence. The participatory session on "Ethical Dilemmas of Reporting in Conflict Situations" was led by Prof. Clayton Peel of NUST. He used selected reflections drawn from BBC reporter George Alagiah’s book on the experience of covering the Somali crisis. Prof. Peel asked participants to consider several complex ethical dilemmas a journalist might face in conflict zones and how they would react. The cases discussed addressed several issues, including using graphic images to convey the reality of conflict; how to give grieving people space and avoid exploiting trauma; and weighing the decision on whether a journalist should report the truth when it might negatively impact the communities they are covering. Participants were divided into groups and had to report back on the results of their deliberations and share the reasoning behind their conclusions. NUST lecturer, Dr. Ellis Hugh, gave the final lecture on the “Safety of Journalists in Conflict Zones.” Between 2012-2016 there was a slight decrease in the number of journalists killed, harassed, or imprisoned for doing their work. However, over the same period, 530 journalists were killed in the line of duty. Dr. Hugh observed that reporting from conflict zones is much more dangerous for local journalists than it is for foreign correspondents. He also pointed out that women journalists face particular challenges both in the field and online— they are more likely to be harassed and cyber-bullied. He urged news organizations to give journalists enough training and resources to carry out their assignments; these may also include mental health resources where appropriate. Workshop facilitator Dr. Admire Mare led a brainstorming session on "Digital tools and Platforms for Disseminating Stories on Conflict and Peacebuilding." Among the topics discussed included the rise in government legislation cracking down on social and online media; managing both a personal and professional online presence; and the latest tools for journalists to keep news sources (and themselves) safe. In his closing remarks, Dr. Cyril Obi described the event as “one of the best media practitioner workshops” supported by the APN. It was also agreed that the papers and presentations would be compiled and published as a manual for conflict reporting in Southern Africa, adding to the series which began with a manual for journalists in West Africa. NUST Dean of Human Sciences Prof. Alinah Segobye thanked the APN, on behalf of the university, for contributing to the professional development of journalists in southern Africa. She encouraged participants not to see the worlds of the academy and practice as entirely separate and emphasized the traditional connection between the “African intellectual voice” and journalism, and their shared commitment to speak for those who cannot. Prof. Segobye urged journalists to incorporate the lessons of the workshop into their work to contribute to peacebuilding in their respective contexts meaningfully. In addition to the workshop training sessions, the APN hosted a networking dinner for participants at a local restaurant in Windhoek. 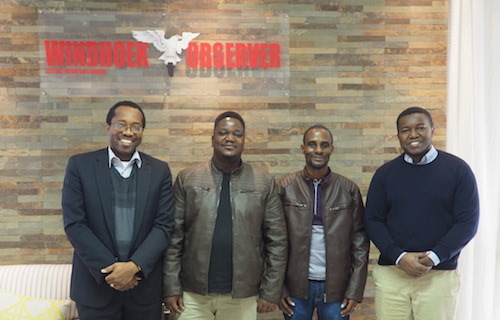 On July 20, APN Program Director Cyril Obi, accompanied by APN staff, visited the offices of the Windhoek Observer, Namibia’s oldest and largest circulating weekly newspaper. The APN team met with the paper’s news editor, Nyasha Nyaungwa, to discuss the work of the APN and learn more about the media landscape in Namibia. The discussion covered key issues facing Namibia, including racial reconciliation, equality of opportunity, and how to distribute the fruits of independence to ensure sustainable peace.